There is a mystery in Geekdom. 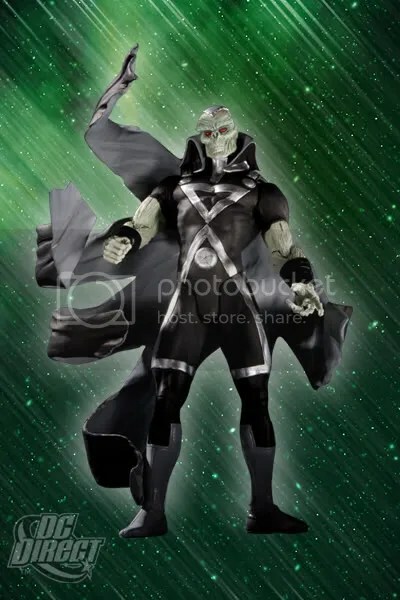 DC Direct has been producing some pretty neat action figures in relation to the Blackest Night mega-event that is taking place in the Green Lantern titles (and, soon, the entire DCU… my wallet is already crying). 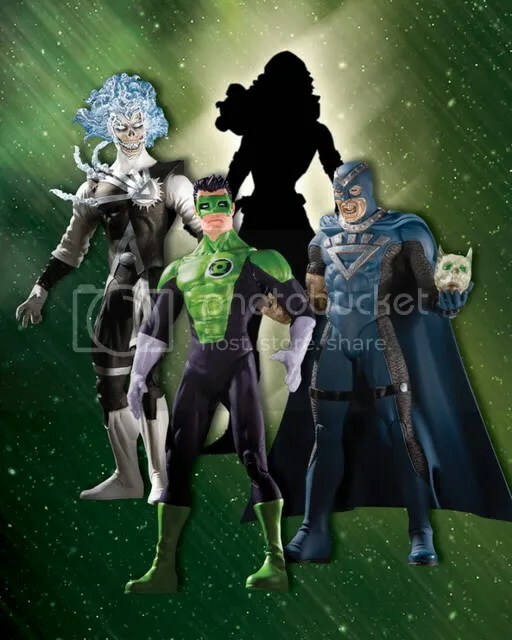 The next wave included Black Lantern Aquaman, but I don’t think his promo was blacked out. It might have been, but I don’t recall. The wave of figures after that, though, is where the real mystery is. 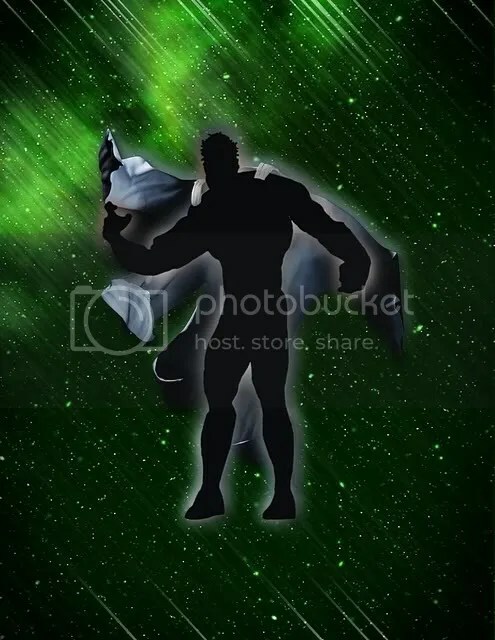 What makes this figure so mysterious is that, unlike the previously blacked-out figures, this one hasn’t been spoiled. Kal L and Martian Manhunter were uncovered within weeks of the initial promo. This figure… it is well over two months now. Don’t get me wrong, it is nice to NOT be spoiled… but it raises a lot of questions. 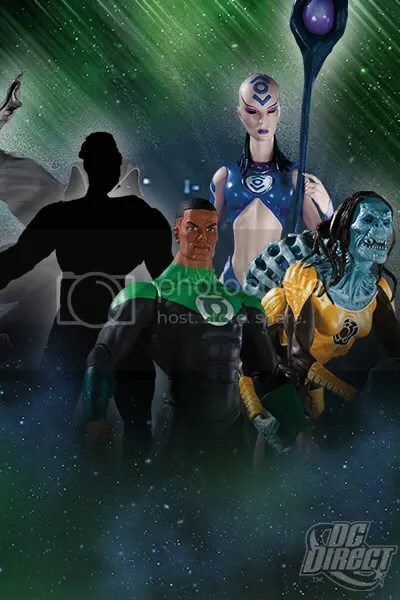 All of the previous mystery figures were Black Lanterns, does this mean Wonder Woman will be a Black Lantern? 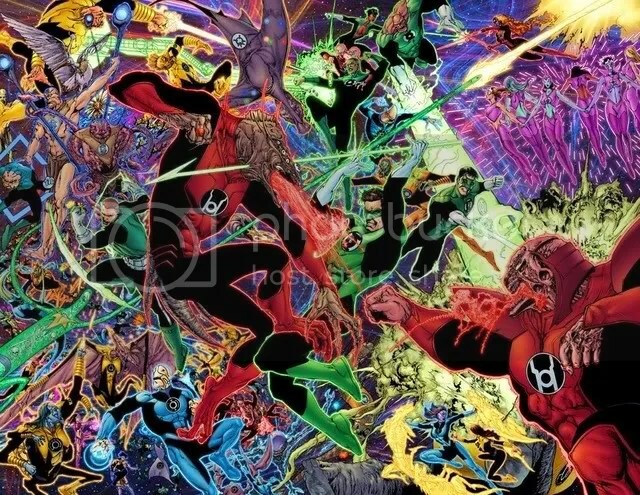 But, each wave up until this one only has one Black Lantern, and this wave already has Black Lantern Firestorm. Which leaves us to wonder (get it? wonder? ha!) if Wonder Woman will be getting a ring, and if so, which one? Looking at the figure, it seems to have the same skirting that is seen in the drawing. And, thus a lot of folks seem to make a massive leap to say that the figure must be that Star Sapphire, and since the solicitation for the figure says it is Wonder Woman, Wonder Woman will be a Star Sapphire! That… is a pretty flimsy reason to make that leap. The whole “Power of Love” (man, I love Huey Lewis and the News) thing the Star Sapphires have going on doesn’t mesh with my idea of Wonder Woman. Plus, the ouline of the figure doesn’t really match up with that Star Sapphire costume. A lot of folks think Wonder Woman may become a Blue Lantern. But, as passive as those Lanterns are, I don’t see that either. Green seems unlikely. Red? An angry Wonder Woman is a thing to behold, and might work. Yellow is possible, but less likely. Sure, she can inspire fear, but as an ambassador to the world, it seems against her nature. Orange? Nah. Which leaves Indigo. And, while attaching an Amazon Warrior to the Indigo Tribe seems like a more natural fit, I’m not buying it either. I’ve never seen Wonder Woman as a mercy killer. After all, Diana Prince isn’t the only woman ever to be Wonder Woman. 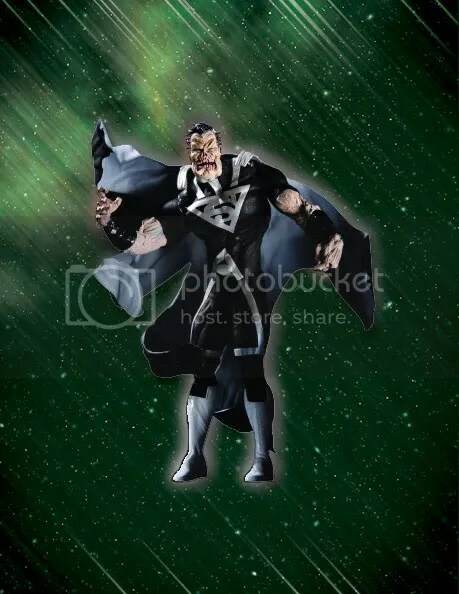 She was seen again back during Infinite Crisis, so maybe she is coming back to take care of the Black Lantern Superman of Earth 2. That’s right – for a time, Diana’s mother served as Wonder Woman. She even traveled back in time and served with the original Justice Society of America. I’m not sure if any of this has been retconned, but it is a possibility. Ah, the 90’s, when superheroines all had gravity-defying hair and broken backs! Yes, Artemis, the grim-and-gritty version of Wonder Woman! She served as Wonder Woman after Queen Hippolyta called for a new contest for the title of Wonder Woman in an effort to protect Diana. Could be her… and, she’s already dead, so she’d be able to slip into a Black Lantern costume pretty easily… which is necessary with that back condition. 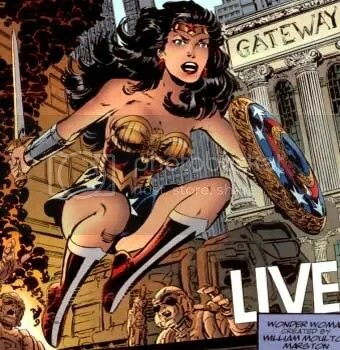 During the year that Diana took off for 52, Donna served as Wonder Woman in this far-superior costume! (Yeah, personal opinion, but, c’mon! That IS a much cooler costume!) Plus, if you are reading the Blackest Night: Titans comic, you’ll know that there is a real possibility here. Plus, she seems to be wearing the correct skirt (or possibly the sword) that is seen in the mystery figure. Which is why Donna is my odds on favorite for this figure – a Donna Troy as Black Lantern Wonder Woman. Why as Wonder Woman? Well, her other costumes have been generally unremarkable. 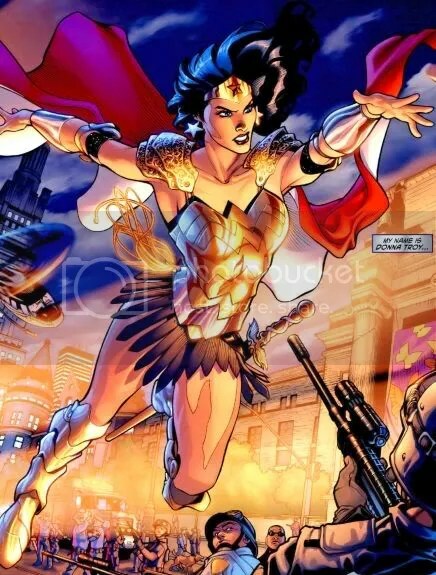 The Wonder Woman outfit is more distinctive, and should mess with the minds of the other heroes quite a bit, too. I know – not the best, but it gives the idea. I could be completely off base here, but we’ll see!